Looking around for professional fencing contractors Hillarys in Perth? Save yourself time, money and frustration by hiring the best in the fencing business – Team Work Fencing Contractors. 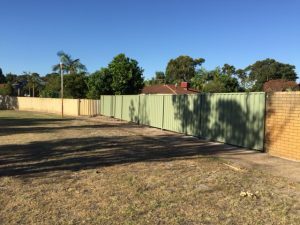 Widely regarded as one of the top fence builders Hillarys, Team Work Fencing provides high-quality fencing services in Perth and all throughout Western Australia. We offer residential fence installations, repairs and maintenance of pool fences, PVC vinyl fencing and EZI-SLAT aluminium fencing, as well as brush fencing, timber fencing, decorative fencing, HardieFence™ fencing and COLORBOND® fencing in Hillarys. If you’re a business in the area looking to spruce up security to protect of personnel and assets, our fencing company in Perth also provides fast, professional installations and repairs of chain mesh fences, Garrison fences, palisade security fencing and rural fencing. As a matter of fact, our fencing contractors in Hillarys can design a custom security fencing solution for just about any type of commercial property. For home and business property owners interested in adding physical enhancements to their new or existing fences, Team Work Fencing Contractors (TWF) can install complementary gates, toppings, claddings and a variety of other perimeter features to increase security, privacy and aesthetic appeal. It’s just a matter of you letting us know what you need. If you’re not sure, we’re more than happy to offer advice. Have a fencing project that you need handled quickly and affordably by professionals? Contact us here to let us know the details. Our fencing contractors Hillarys will even visit your property and provide a no-obligation quote. Note: All work by TWFC is performed using recyclable materials in line with eco-friendly practices.